From time to time we may post items in this section that we prefer to use as trade-only material. For now, we are putting prices on most everything you see on the other pages, to give you a buy option. But we consider trades on any quality items you may have available, so email us with what you have if you'd like to trade. 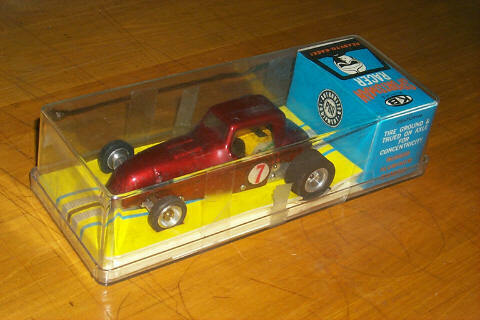 K&B 1/24 Sportsman Racer, mint unused in box. This is a real gem! Has instruction sheet in box, along with hex wheel nut wrench. Box has been opened, but car has never seen track time. There is a small amount of age discoloration on the side number stickers, and some dirt spotting on the outside of the body, but this is removable. This car would look great on your shelf. 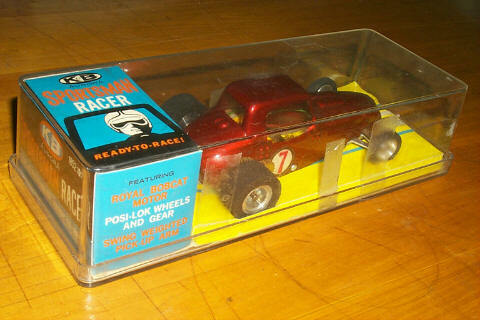 Would like to trade for another rare mint single HO or large scale slot car. Let me know what you have- I'd like to get a gray T-Jet hot rod or something of equivalent rarity in trade. Click here to see my extensive want list. If you have an item on my want list, please let's try and trade for something! 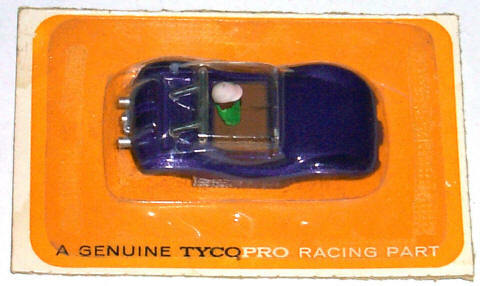 Tycopro purple Dune Buggy, mint on card, body only. Card blister popped open one day when it was bumped lightly, and so was reglued well to reseal it. You see no signs of ripped paper (the old factory glue just got brittle and loosened over time). There are some whitish stress marks in the blister you can see in the photos. Tyco HP2 Funny VW, near mint. Has a couple of faint roof scratches, not major flaws. Would trade this for a Tyco drag VW (version with no chrome engine and with rear exhaust pipe) in gold/red or silver/orange. Tyco McLaren M8F, red/yellow/black. Very rare uncataloged color version of this car, molded in red. Rear wheel wells are cut, and there is a crack on the top behind driver area. Missing pipes and driver. Cockpit plastic also has cracks. Roll bar is missing most of chrome. Rear vents have some cracks. Curvehugger chassis has worn pickup shoes and guide pin needs to be replaced. Tyco McLaren M8F, orange/blue/white. Very rare uncataloged color version of this car, molded in orange. There is a crack on the top behind driver area. Missing pipes and driver. Cockpit plastic has a crack. Whitish stress marks are present in the plastic in front of wing area on top of body, and the body sides have some waviness in the plastic. Roll bar is has some chrome wear. There is a bit of glue residue on nose where some stickers were present. Chassis (curvehugger) has stripped pinion gear.